After 25 years of painting, EJ Hauser says she still feels like “a sculptor who paints” and sometimes even envisions her paintings as depictions of imagined sculptures. The large works on papered canvas exhibited for Surviving Sandy readily deal with the flat marks of drawing and direct handwriting yet these explicitly two-dimensional components are structured and arranged with a kind of three-dimensional logic. Hauser describes the paintings as “stacks”—as if to her, a written phrase of text or any drawing idea must be given an autonomous material identity—layered, modeled, manipulated, or collaged. EJ Hauser, “forgetmenot two,” 2012. Oil and paper on cavas, 73 x 70″. Courtesy of the artist and Fredericks & Fraiser. Photo by Brian Buckley. Drawing is the cornerstone of Hauser’s practice—its connection to the material, the relationship to writing, and as a generative act of its own. Hauser works with what she calls “drawing labs”—low stakes, highly editable drawing sessions where she works from paintings in progress in the studio. The result might be drawing that comes from a painting that was originally based on a drawing. Hauser thinks of resemblances and connections between cross-pollinated works as familial—related and giving birth to one another. The paintings make the chains of thought explicit, and there’s delight in discovering the unlikely resemblance between the lattice-like grouping of block letters in moonflower two (2012) and the ornamental figures from a Grecian urn in the background of forgetmenot two (2012). Hauser thinks of resemblances and connections between cross-pollinated works as familial—related and giving birth to one another. Despite the works’ structural complexity, the paintings always look like they were made off-hand and hide their own virtuosity. 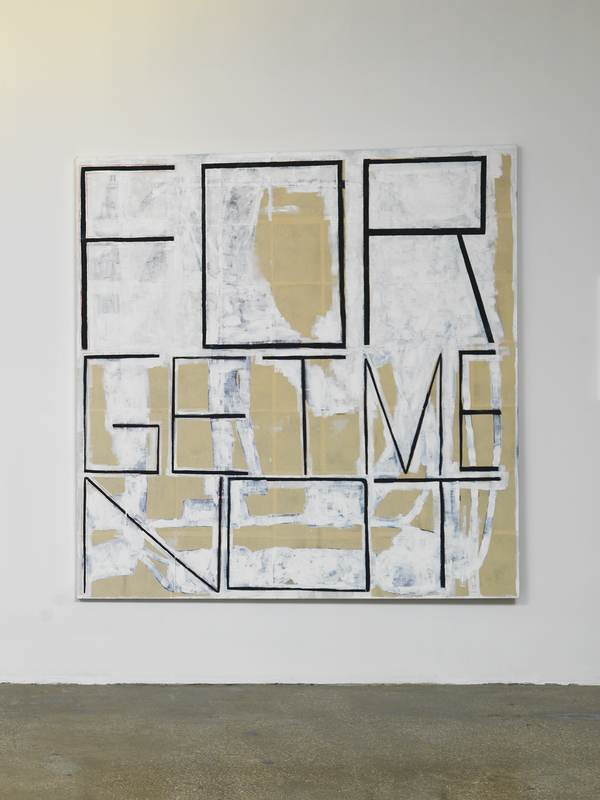 In moonflower two (2012), large block letters (“MOONFLOWER”) are put down quickly and imperfectly in white paint, covering the entire canvas; subdividing the first layers of the drawing. Like a Sharpie bleeding through paper, painted marks from layers below peak through. The works are built through a series of compounding layers, which transpose each other. In other areas, the speed and the trajectory of the written letters are revealed as the brushstroke crosses sections of wet paint leaving a track of color smeared into the white capitals. Other works like Thus one (2012) just exist in the realm of letters—because of Hauser’s appreciation of letters as images, geometric propositions, and agreed upon sign systems. Text is often the most accessible part of the paintings, but the speed of word recognition is so instantaneous as to interfere with looking beyond the text into the pools of amorphous drawing that require slower viewing to emerge. But with so much attention given to the under-layers—veritable paintings that could stand alone unto themselves—these works challenge the viewer to look beyond the readily legible and recognizable.